In the last week we hosted four representatives from the city of Vilnius in Lithuania for a study tour of Assen and Groningen. It was a publicity stunt, of course, but the Mayor being involved in this way demonstrates that increased car usage has caused problems which reach right through society. Vilnius is not alone in this of course. The same problems are seen in very many other cities around the world. The Vilnius representatives came to Assen and Groningen in order to see how cycling could help. Every journey by bike is a journey which is not taken by motor-vehicle. On Thursday morning I woke early. I remembered that some months ago, Todd Edelman forwarded me a link to an article about public transport usage across Europe. The Czech authors of that article used it to point out that their country has the highest public transport usage across Europe, a deserved boost to morale for a country with very good public transport. What woke me was remembering that I wrote back at the time to say that it also demonstrated something about cycling. I realised that this could also perhaps be of interest for Vilnius, as well as many other cities facing similar dilemmas. It's simple to explain this. As nations become more wealthy, their people desire motor vehicles and other luxury items. Once it is possible to afford them they will buy them. This phenomena is not restricted to Europe. It's been observed most dramatically in recent years in China, which has very quickly transformed itself from being notable for its high rate of cycling to being notable for its massive traffic problems. I thought it interesting to look at where Lithuania and the Netherlands appear on the graphs in the report. 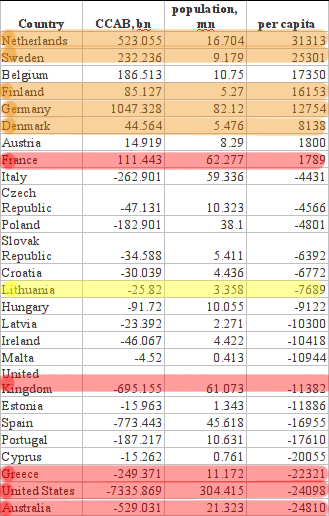 To make it obvious, I've highlighted the figures for Lithuania in yellow and those for the Netherlands in orange. I've also highlighted France in red, this being a typical low cycling rate established western European nation. My conclusion: Unless there is another factor which changes what people do, as countries become more wealthy, their people stop using public transport and instead drive cars. 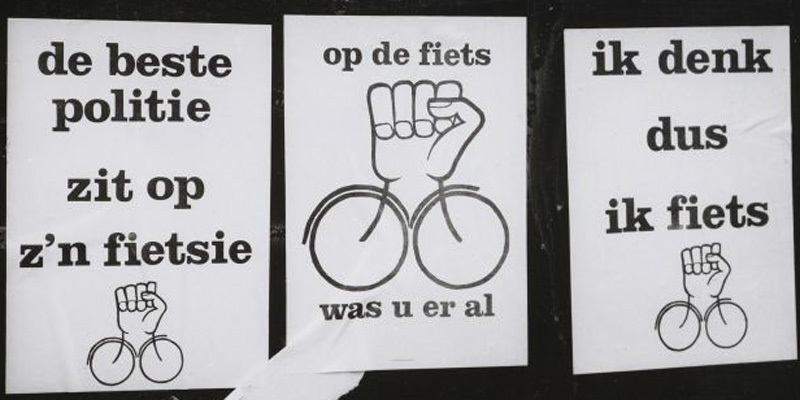 The attractiveness of cycling in the Netherlands has lured people away from cars to an extent that public transport has not achieved in any rich nation. This makes a huge difference to overall transport patterns. If no action is taken then the likely future for all Eastern European nations, including Lithuania, as well as in developing nations all across the world, lies with cars taking over from public transport. This increase in car ownership and use results in roads which are uncomfortable on which to walk and cycle, walking and cycling risk becoming low status activities, and stopping their decline becomes difficult. If this happens, it comes at a huge price not only in monetary terms due to the enormous cost of building roads, importing oil and cars, but also in environmental problems, road casualties, congestion, rising obesity and lowered freedom for children. However, there is a choice. If these nations instead emulate the Dutch approach and retain a high rate of non-motorized travel by making cycling into an attractive alternative to driving then the future can be brighter. Encouraging cycling has many other benefits. These reducing environmental problems, improving the public health, reducing congestion and increasing the happiness of children. However, perhaps the raw financial aspects are most attractive. If 30% instead of 20% of journeys can be non-motorized in the future then this makes a huge difference to the cost of roads and maintenance of roads. There will also be less fuel needed to power those cars. The potential savings are far larger than the cost of providing even the best cycling infrastructure in the world. The choice of copying the "Dutch" approach has been taken by some of the most successful countries in Europe. 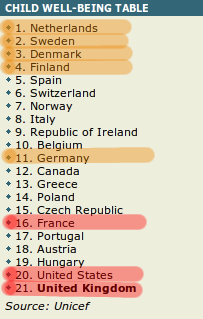 In these graphs I also highlight in orange other countries which have taken steps to be similar to the Netherlands and in red other countries which have taken a similar approach to France (including some which are not in Europe but are often taken as examples). We now see that the most wealthy nations in Europe (those which have the highest positive current account balances per capita) are also mainly those which have adopted positive measures for cycling. A UNICEF survey to identify the world's happiest children also highlighted the same countries as having the best conditions for children. Cycling plays a role in both of these other results. The high non-motorized transport rate of the Netherlands directly translates into a reduction in the amount of money which leaves the country to pay for imported oil. It also drastically decreases the cost of road-building and of imports of motor vehicles and parts as well as costing businesses less due to fewer working hours being lose due to traffic congestion and illness. These all have an effect on the Current Account Balance and help the Netherlands to remain in profit year on year. 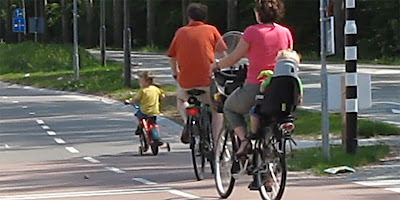 Cycling also plays a large part in the happiness of Dutch children. They have a very high degree of freedom from a young age as their parents are not so concerned about their safety on the safest streets in the world. Why make the choice for cars ? The default position for many nations is to just let things happen. Individuals buy and use more cars, and the state provides for this. It is sometimes thought that high car ownership and usage are synonymous with development. This is seen as both the path of least resistance, and also of giving people what they want. However, it is actually a very expensive choice by government which leads to individuals having few choices in the future. This policy has been followed by many countries, including all those highlighted in red on the graphs above. Many of them now have extremely high levels of debt. The alternative choice, of choosing to spend money on building high quality cycling infrastructure and encouraging cycling is both less expensive and better for society. This is the path which results in emulating the success of the Netherlands, Denmark, Germany, Sweden, Finland - rich countries with a high standard of living. Is this not what everyone wants ? Even the most expensive cycling infrastructure in the world is cheap compared with building motorways. Like many other countries, Lithuania is currently in a position where it needs to make a choice. Right there in the capital city of Vilnius a decision needs to be made about whether to try to accommodate ever increasing numbers of cars, or ultimately to spend less money in providing better conditions for their citizens by encouraging the type of development seen in the Netherlands. The message sent to the world by the Mayor of Vilnius shows that the issues are on the table. Update: Why emphasize non-motorized transport ? 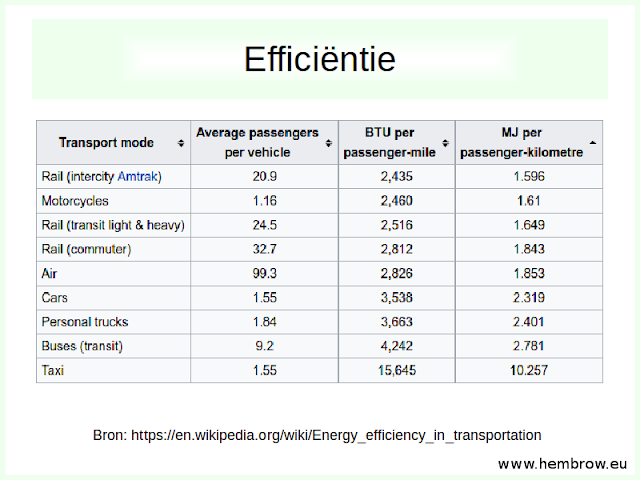 All motorized means of transport have similar energy usage per passenger kilometre. Switching from one motorized mode to another can't make a significant difference to overall energy usage. It is only by reducing our use of motorized means of transport that we can significantly reduce our carbon emissions. Also see my blog posts about the effect of transport on the environment and my 2017 presentation about energy efficiency of transport. 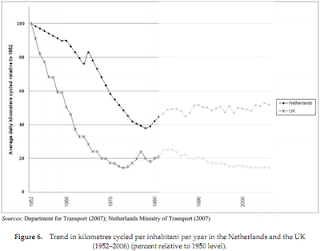 The document that I link to is concerned with promoting public transport and therefore doesn't comment at all on the much lower rate of motorized travel in the Netherlands vs. other countries. Instead, improvements are expected to come from funding public transport. The public of all countries tends to support the notion that "Better public transport" would improve the traffic situation. However, in many cases it seems that the expectation is that someone else will use public transport while they'll continue to drive. For this reason, I don't think this is an effective policy. Most short distance public transport use is because people have few other choices, not because sitting on a bus is a positive choice in itself. Cycling has the potential to attract people away from cars in a way that buses cannot because it is a personal mode of transport, not a public mode, and can be used to make any journey at any time without waiting or making detours. Note also that there is a reason why Cyprus is an outlier in some of the graphs above. This country sadly provides fewer choices for transport than elsewhere. Wikipedia says, "Because Cyprus has no working railway system, various other methods of transportation are needed to ensure the proper delivery of any cargo, be it human or freight. Since the last railway was dismantled in 1952, the only remaining modes of transport are by motorways, by sea, and by air." The result is the highest car ownership rate in the world and while sport cycling remains of interest to a minority, conditions are unattractive for everyday cycling. Another thing to note is that the huge number of people who park bikes at Dutch railway stations and bus stops are counted in surveys like this one only as public transport users. In any case, the low proportion of public transport usage vs. other modes means this doesn't skew the results much. The margin of error of these surveys is actually quite large, as can be seen by comparing results from one year with the next. There are many things about streets in the Netherlands which are misunderstood. 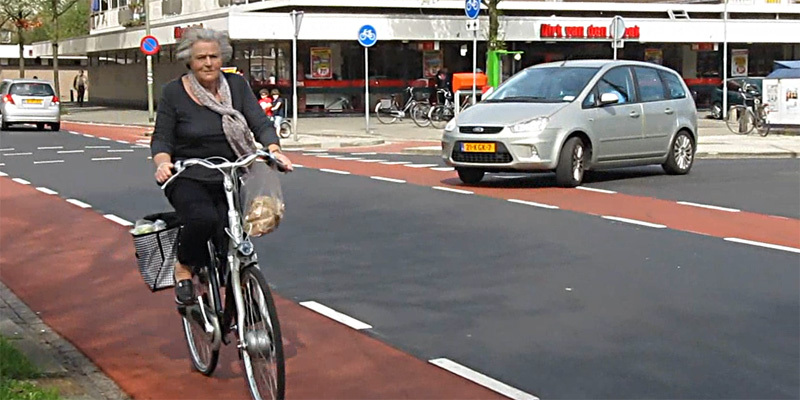 For instance, many people write that Dutch cyclists "still share with drivers" on many streets. It's true in the literal sense, but streets here are not the same as streets in other countries such as the UK. 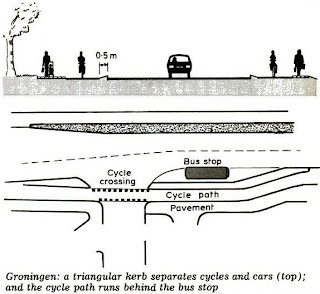 This can be difficult to understand, as the difference is not so obvious as when there is a segregated cycle-path. However, even on streets like this, cyclists benefit from a form of segregation of modes without cycle-paths. It's not "sharing the road" as many people think of it because routes for drivers and cyclists have been unraveled from one another. 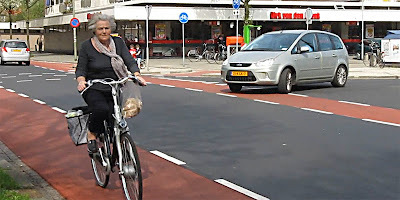 In this post I show a few streets in the centre of Assen and show how they work for cyclists and drivers such that despite their appearance, they are optimized for cyclists. 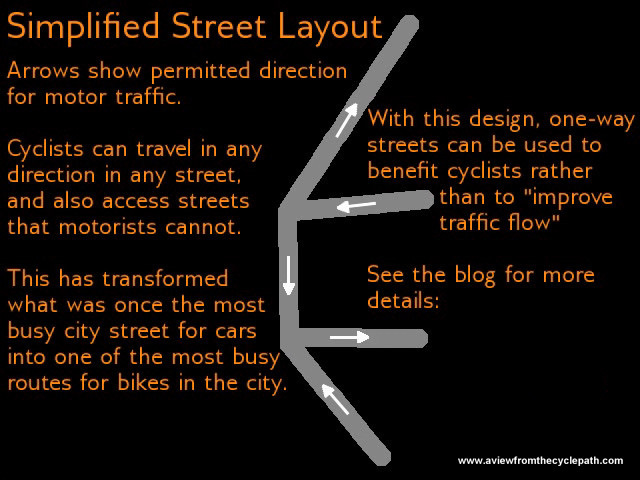 After watching the video, read further to see a map showing the layout and towards the bottom of the post for photos of what the same streets looked like in the 1960s when they were optimized for drivers. Note that this video has many captions which explain what you are looking at. They are only visible on a computer and not on a mobile device. Click for Google Maps. The video follows the red line from bottom to top. 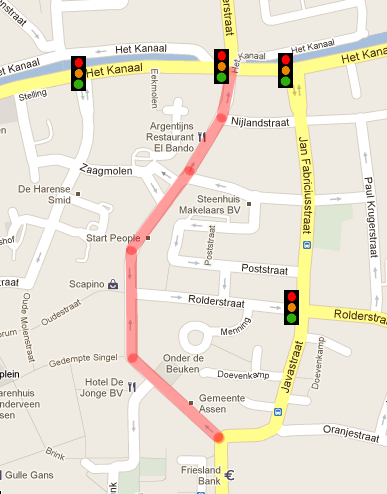 Drivers are directed by the one way system along Javastraat, Jan Fabriciusstraat and Het Kanaal. This removes them from the route through the centre taken by cyclists. These used to be the busiest streets in Assen for motor vehicles. However, they were redesigned, using a one-way system which prevents motor vehicles using it as a through route. Drivers now have to take the streets in yellow, which are optimized for driving and which have traffic lights on them. The one-way system for drivers. Cyclists can use any of these streets in any direction. Note how the The cycle route is more direct and doesn't have delays caused by traffic lights, but drivers can't use it because for them it is no longer a through route. 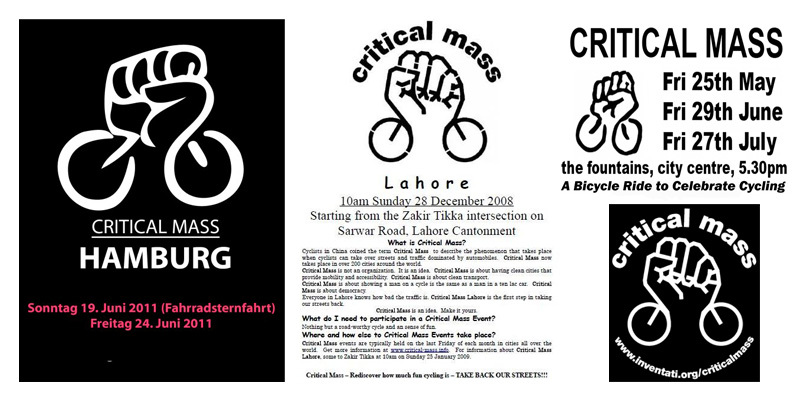 By these means, the streets are calmed and cyclists are given priority in the central area. This has been so successful that very few moving cars are encountered by cyclists on these streets now - a huge contrast with the older situation. Note that in many places, this street is less than 12 m in width. That figure includes all available width including pavement (sidewalk), parking, cycle lane and road. Read more about this street, watch a more up-to-date video. In the video we ride from right to top/left from approximately 0:45 until 2:02. This photo shows how the same streets looked in the 1960s. This is how the junction at 1:15 in the video looked in the 1960s. Note how pedestrians had to walk on narrow sidewalks behind barriers which prevented them from crossing the road wherever they wanted to and how there was "not enough space" for cycle-paths on these streets. 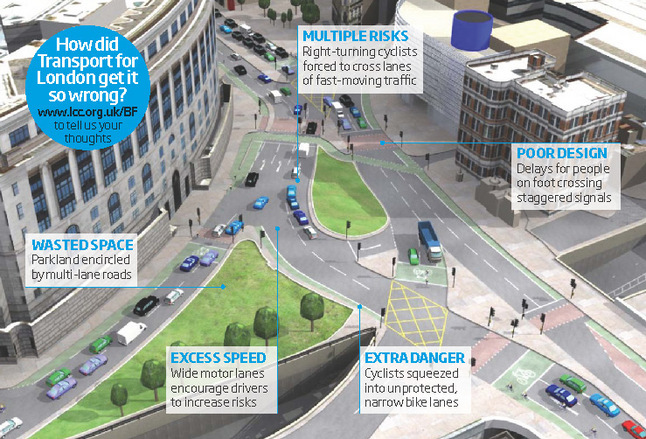 This is similar to many current British road layouts. This junction appears at 1:38 in the video. In 1965, this was the busiest junction in Assen and traffic lights were needed in this location. There is a blog post and video specifically about this junction. There are shops on these streets which sell items such as washing machines and televisions. These are the types of goods which many people would rather transport by car than by bike. They can do so. You don't need any special permission to drive along here, these are still streets which are open to all users including drivers. However, the way in which they have been developed prevents their use for through traffic. This is an example of segregation of modes without cycle-paths. It works. Even in the city centre. Due to their central location, and that they remain a through route for bikes even though not for cars, these streets are very popular with cyclists. A count here showed nearly 9000 cyclists per day using these streets: a very impressive figure in a small city of just 67000 people. Nearly 9000 cyclists a day use this route now. They use the entire space. Encounters with moving motor vehicles are rare. Streets which some commentators from outside the country think are "shared equally" with motorists are in my experience never anything of the sort. This is not a rare arrangement, but a very common one in streets like this - optimized for cycling, but allowing access to drivers. Where there is significant through traffic, cycle-paths are required to preserve an acceptable level of subjective safety. That includes just North of where the video in this post ends. Access to this road by car is possible, but it's not a through route by car any more so people drive here only for access. While cycling always benefits from segregation from motor vehicles, that does not mean that all cycling is on cycle-paths. There is not a one-size-fits-all solution for all streets. Sometimes segregation is achieved by moving cars elsewhere. It is very easy to get an incorrect impression and to miss things like this. Unfortunately, some people visit the Netherlands and go home again still with the wrong impression. This is why we offer study tours and encourage campaigners and planners to come on them. They are a means to explain how details like this work, and to show people actual working examples. The photos come from the book "Assen Verandert" which we reviewed. There are a number of other posts about Groningerstraat, showing more about the road North from the end of the video in this post. You'll note that where the road is busier, there are cycle-paths because you can't achieve a high enough level of subjective safety for mass cycling on roads with a large number of motor vehicles. The recent video to introduce the Dutch Cycling Embassy explains this very briefly, but there is a lot more that can be said about it. 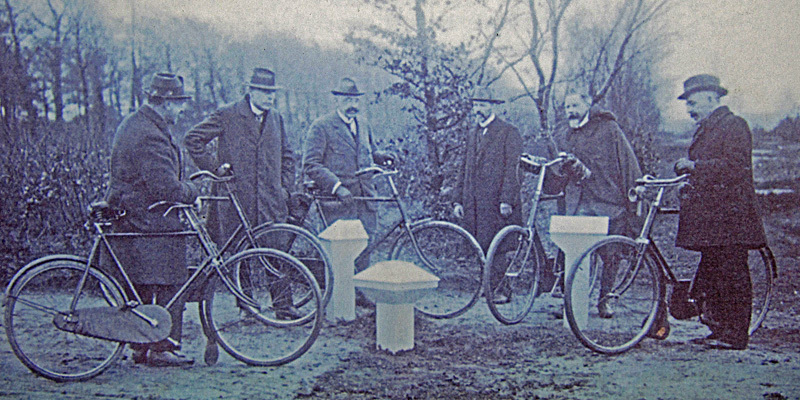 That is why I made a longer video for a more in depth look into the history of cycling infrastructure in the Netherlands. Please watch this video before you read on. Thus ends my video, but what do I mean by that? I think the Dutch could and should be copied. If you look at the key factors for the change in Dutch thinking, you see these are just as valid today. The world is still too dependent on fossil fuels and many cities in the world have congested streets. Streets and roads which are also very dangerous, especially for vulnerable road users like pedestrians and cyclists. And that is even more so when these road users are elderly or children. Other elements leading to the change are also not unique. That is not only so for the protest posters. 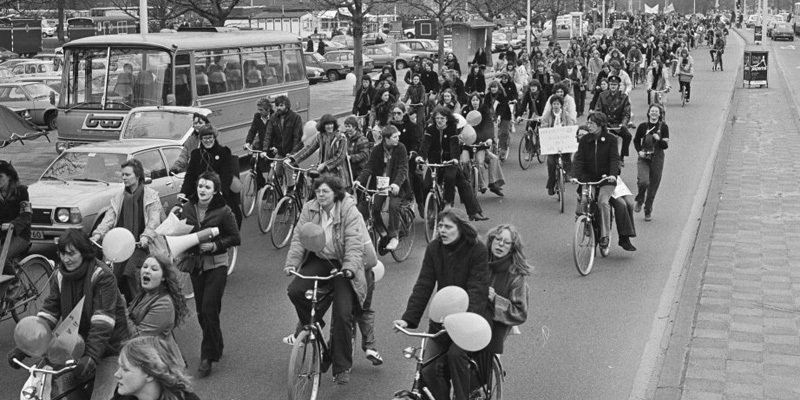 The mass cycling protests in the 1970s look very similar as well, compared to protests in other countries today. Like the massive number of people protesting by bike on London's Blackfriars bridge just a couple of days ago. 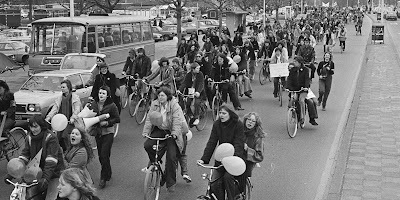 Cycling protest tour 1979, Amsterdam. Blackfriars protest tour 2011, London. Even the rogue painting of cycling infrastructure on roads is something that could be witnessed just a few weeks ago in Moscow. So where then is the difference? The below picture from 1974 says a lot. 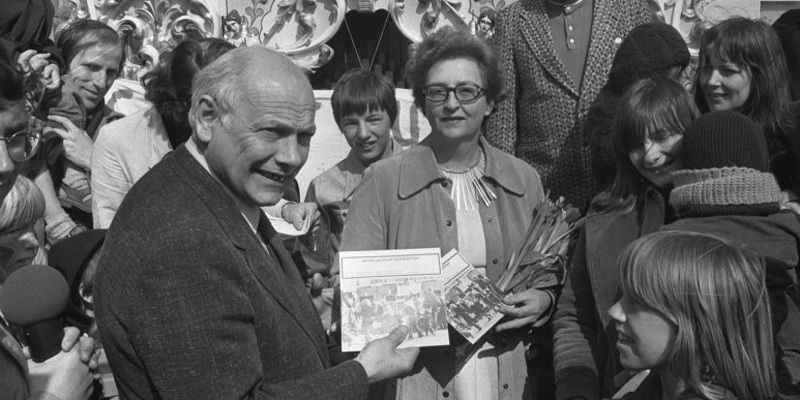 It shows the then prime minister of the Netherlands Joop den Uyl and his wife, accepting a record from the foundation ‘Stop de kindermoord’ (stop the child murder) with a protest song. "playing on the streets: death penalty"
This was at their home where they were adressed as parents. It gives a clear picture of how the pressure groups of the 1970s managed to get the political powers to listen to them and take action. It took them a decade, before not only decision makers, but also the planners finally listened to the protests. Getting the people who take decisions and those who have to draw plans for the streets to adopt the new ideas: that is where the real change started. Read more posts about campaigning. See examples of what works in the Netherlands. This is one of the most popular posts by Mark. Note his emphasis in the last paragraph about addressing the Prime Minister and his wife as parents. They were addressed as equals and as people in a similar situation to the protesters. This was not a "them vs. us" situation but one of mutual respect and support. This is the essential difference between how the Dutch achieved change and how many other campaigns elsewhere have failed to achieve change. Campaigning for cyclists or cycling is not effective as you're then campaigning for an out-group and not proposing something beneficial to the masses. Similarly, there is no point in campaigning against drivers as you are then pitting a small group against a much larger group. What's more, while the Netherlands has been more successful than any other nation at reducing use of motorised transport, this country has achieved that end without alienating drivers and without overt anti-car measures. Choosing to fight against drivers means picking a battle which cannot be won and one which in any case you don't to fight. Read other posts about campaigning which further this discussion. I've written previously about how noise barriers are used to make sure that residential areas are not spoiled by the noise which comes from motorways. The combination of quiet road surfaces, lower speed limits near residential areas and noise barriers is very effective. However, noise isn't only a consideration for residential areas. 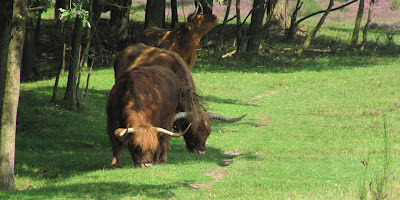 Drenthe has many large natural areas of heath and forest and these also can be spoiled by noise. Our local TV station covered the story of a new noise barrier being constructed along the side of the A28 motorway. 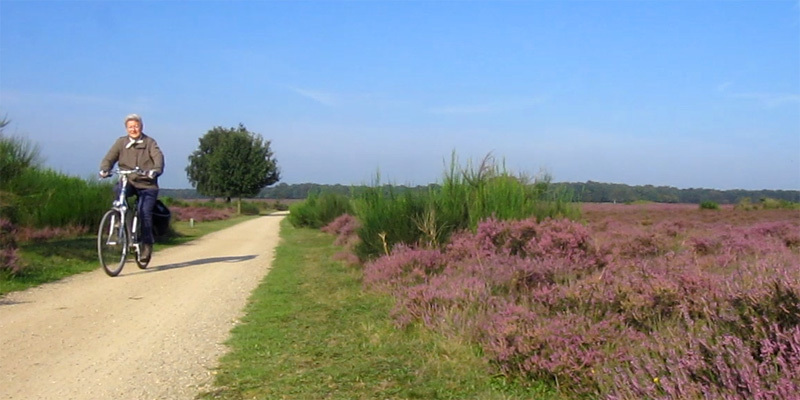 It will be 5 km long, and protect the nature area known as the Dwingelderveld. The red line shows the position of the new noise barrier. No-one lives close by the western edge of the motorway in this position, so this barrier is not to protect homes from the traffic noise. It looks a little ugly at present, and has required chopping down some trees to make space for the noise barrier. However, this damage won't last for long. The section of the noise barrier by the forest will itself be masked by trees so that it is visually in keeping with the forest. The section by the slightly hilly heath area will be covered in the heath plant, and landscaped so that it also is nearly invisible. The Dwingelderveld is one of ten Stiltegebieden, or "silent areas" in Drenthe. However, measurements taken in 2005 showed that 2/3rds of the time, sounds could be heard, and that the main cause was the A28 motorway. This is what led to the new barrier being planned and built, because otherwise the area could no longer be considered to be silent. This radio-telescope is in the Dwingelderveld. I've been there a few times. See a newer blog post for more photos. The wide age range of people on bicycles is one of the more striking things for visitors to the Netherlands. Very young children can be seen cycling with their parents on the streets, sometimes even still with stabilisers on their mini-bicycles. Younger children are often passengers. These kids start cycling to school and other destinations unaccompanied at the age of 8 or 9, giving them an independence and freedom which is unparalleled in the world. On the other end of the spectrum the senior citizens keep on cycling to a very high age indeed. Sometimes aided by electric bikes, but more often just because they simply still can. It gives this age group health and other benefits similar to the young children: freedom and independence. Safe streets for people from 8 to 80 is not a concept to strive for in the Netherlands, it has already become every day reality. Dutch streets are complete streets and Dutch cities are cities for people. Decisions that led to this reality were taken deliberately in the late 1970s and the early 1980s. 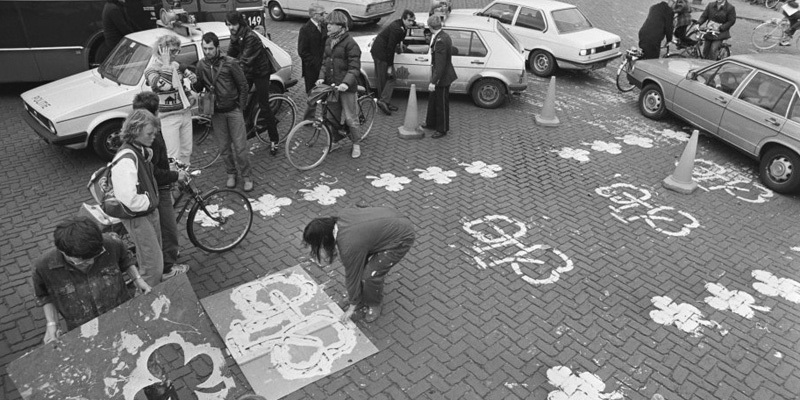 The (re-)construction of the cycling infrastructure mainly took place from the 1980s up until now. First an a smaller scale but really nationwide from the mid 1990s to the present day. at a more senior age. 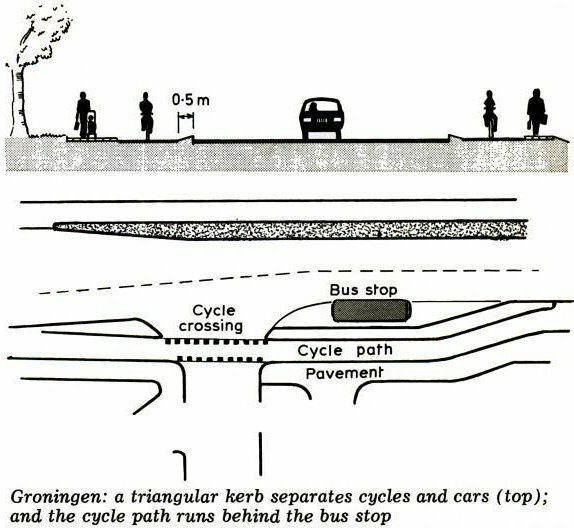 Early examples of Tilburg (1977), The Hague (1975-1981) and Delft (1979-1986), already showed that creating a sufficiently dense separate cycling infrastructure network does increase cycling and at the same time makes it safer. The Dutch also learned from their initial shortcomings. Later projects, with many improvements in the details of the infrastructure, ranging from the angle of kerbs (curbs), via widths of paths and smoother surfaces, to more priority on junctions, had even better results in cities and towns in every region of the country. Interestingly enough there are no real separate cycling infrastructure projects anymore. The projects are embedded in an integral transportation policy approach. Making cycling equally important and valuable as motorised and public transport. 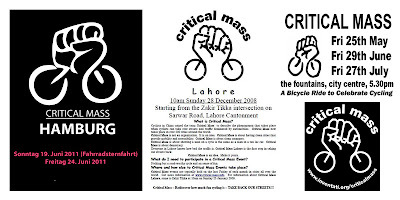 And more: in recent transport policies cycling is seen as the preferred transportation option in a city or town and as such given benefits and priority over the other means of transport. Looking at it on a macro scale reveals that all this led to the country with the highest modal share of cycling in the world’s safest streets, and with the widest age range of people cycling. Yes, you can truely say everyone cycles in the Netherlands, which is very visible in the above video. It's that time of year again. Autumn. Therefore time for a blog post about how leaves are cleared from the cycle-paths. This time I just happened to come across one of the maintenance vehicles on the cycle-path. They do a pretty good job. I've still not slipped on leaves since we moved over here. This also doubled as my "cycle video day" video. The problems around Blackfriars have been going on for a while. By British standards, it is quite remarkable that a campaigning organisation has felt the need to put itself out there so visibly in order to try to influence for the better. They've achieved a good amount of publicity. This is all commendable. The poor design originating with Transport for London. The design they've come up with appears on the face of it to be quite good. Cyclists are kept from most conflict situations (watch the animations). This is of course "just" a first draft from a campaigning organisation, not a "professional" design from the local government in London. However, it is a lot better for cyclists and pedestrians than the equivalent from Transport for London. Given how much space there is around these roads, why have cycle-lanes right next to the other traffic ? Left turning cyclists are required to make too sharp turns and are not adequately protected from left turning motorists. Why not use some of the "cool café culture" area for left turning cyclists ? Why a two stage right turn ? Advanced stop lines / bike boxes should not be part of an improved layout ? They're no longer a part of modern design here. 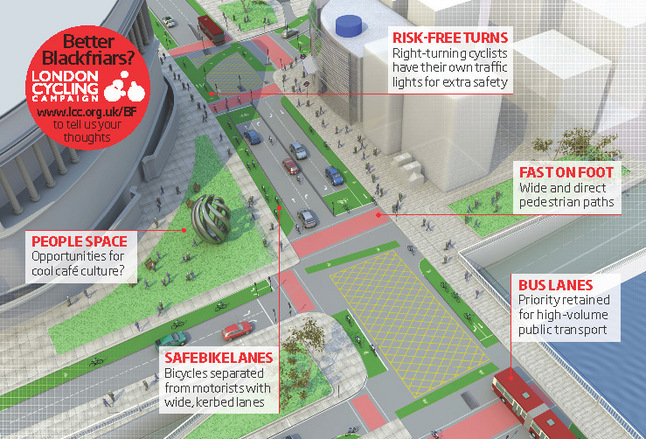 If people feel a need to ride on the road instead of in the cycle-lanes then the design has failed. Why can't cyclists turn left on red, and in some instances also go straight on red ? Also a few details are missing (or perhaps I've simply not seen them). For instance, how wide are the lanes ? 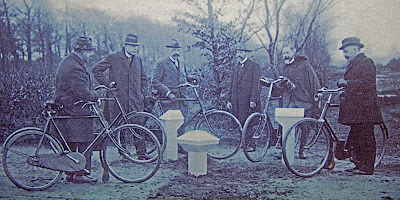 The LCC recently held a poll in which the majority of their membership voted for a proposal called "Go Dutch". The language of the proposal was unfortunately rather woolly, suggesting for instance that only "main roads" should be targeted for segregated infrastructure, and that these should be rolled out rather slowly. What's more, it illustrated this with something far removed from best practice. The response from members seemed to suggest that the membership knew exactly what they wanted, and that they have something altogether more "Dutch" in mind than what the LCC was proposing. This new design also has been described in some quarters as being "Dutch" in style. However, modern Dutch infrastructure doesn't really look like this. 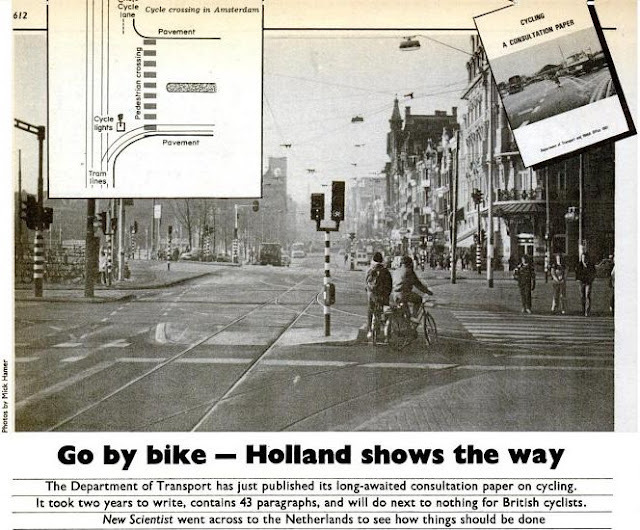 The LCC's proposal looks not entirely different to how some Dutch provision might have looked 30 years ago. There was a lot to like about 30 year old Dutch cycling infrastructure, so this isn't entirely a bad thing. However, in the second decade of the 21st century, I really think that London should be copying 21st century solutions and not looking quite so far backward. Actually, my criticisms are relatively slight. Overall, I support this design. It's far from perfect, but it's a huge improvement on what was proposed by TfL. All that is above is minor criticism compared with what Transport for London deserve. How on earth did this situation ever arise ? This fight should never have been necessary because nothing as ludicrous as the original TfL plan should ever have been proposed by TfL. In a modern city, the proposed design from the LCC should look pedestrian. Maybe it should even look old-fashioned. However, Londoners are describing it as "ambitious" and "visionary". The reason why they see it as such is that TfL has let Londoners down. How did London get to be so backwards in its thinking ? 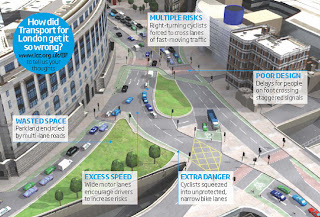 Why is TfL still designing and building new infrastructure with a 1960s mindset ? Works at Blackfriars should mean new excellent infrastructure to link up with existing excellent infrastructure. What is being faced is perhaps managing to build modern infrastructure here, but due to decades of inaction, it won't link up seamlessly with what is around the corner, and across the rest of the city, because everything else is of prehistoric design. If the LCC plan, or something based on it, goes ahead, this could be a new dawn for infrastructure design in the UK. But please, in future, let's see British engineers and planners taking an interest in what has already been achieved in the Netherlands and not trying to reinvent the wheel. The banner reads "Cyclepath must stay - where it is now." There is actually a good precedent to all this debate over the Blackfriars area, and some readers may be surprised to find out that this earlier fight was over a bridge in a very similar situation in Amsterdam. It's perhaps a good omen that the campaigners won and that conditions are now good. The Berlagebrug in Amsterdam was built in 1932 but didn't receive cycle lanes until 1982. 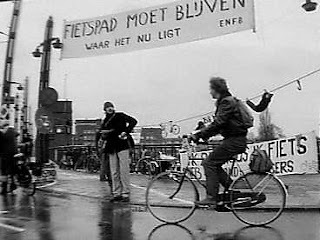 In 1984 they were threatened with removal and the Fietsersbond had to fight to retain a decent level of cycle access over the bridge. If you're in London, go on the flash-ride at 5:45 pm Wednesday 12th October 2011. The Amsterdam Nesciobrug (Nescio Bridge) features in the promotional video for the Dutch Cycling Embassy. 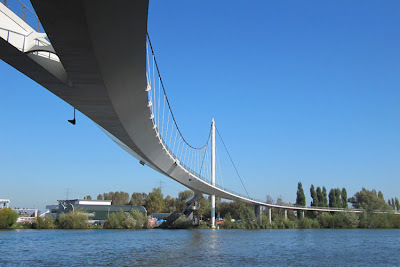 The longest cycle bridge of the Netherlands* was completed in the summer of 2006 and has since been on my must-see list. The responses to the video and the beautiful weather we have had in the Netherlands at the beginning of Autumn were reason to finally go there and ride the bridge. Of course I took my camera with me so you can join in the fun. The bridge, named after a Dutch writer, is of an overwhelming beauty. The blue sky, bright sunlight and the white construction helped a lot the day I visited. But the bridge is magnificently elegant by design. It is huge, spanning 163.5 meters (536.4Ft) over the Amsterdam-Rhine Canal which makes it the longest one cable suspension bridge in the Netherlands. It has a 10 meter (33Ft) clearance over the canal so large ships can easily pass it. The total length of the bridge is 779 meters (almost half a mile). The long approaches at either end provide a conveniently shallow gradient for cyclists. The award-winning bridge was designed by British -London based- WilkinsonEyre architects. And it is -in their own words- "the result of a close collaboration between architects and engineers. The Nescio Bridge provides a vital connection for residents of IJburg, a suburb built on recently reclaimed land north of the city, with the ‘mainland’. Simultaneously, it provides access to the extensive green space of the Diemerpark for the people of Amsterdam." The engineers did a great job. Since the Amsterdam-Rhine Canal is a vital connection from the Amsterdam port to the German hinterland the canal could only be closed for 12 hours. 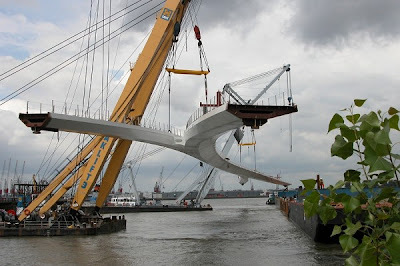 It was in this timeframe that the main bridge part was placed. According to the architects the budget for this bridge was 6.5 million pounds in 2005. At the exchange rates of the time that would have been about 9.5 million euros or 11.4 million US dollar. For one cycle bridge to be paid by the city of Amsterdam. The main bridge part was positioned in under 12 hours. I made two videos. One to show the bridge and the cyclists using it in all its glory and one with rides over the bridge. 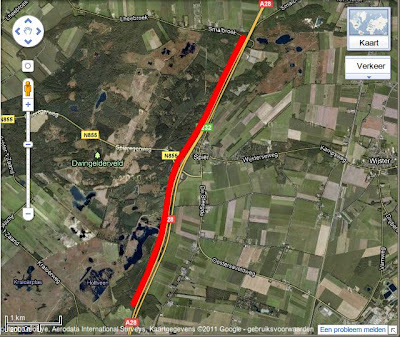 The first ride is from North to South (from IJburg to Amsterdam) and then from South to North (Amsterdam to IJburg). Video showing the bridge and the people cycling on it. * The Netherlands has more 'long' bridges, so you can argue which one is "longest". The Nijmegen 'Snelbinder' bridge is a lot longer than this one. But it is attached to an existing railroad bridge and as such not a specific cycle bridge. Why this isn't so important as you might think Exceptional infrastructure like this is always interesting to see and it makes for easy blogging. However it's not significant so far as getting people to ride bikes. What causes people to cycle in large numbers is the very tight network of everyday, but high quality, cycle routes.